Opposition to immigration exists in most states with immigration, and has become a significant political issue in many countries. Immigration in the modern sense refers to movement of people from one state or territory to another state or territory where they are not citizens. Illegal immigration is immigration in contravention of a state's immigration laws. Opposition to immigration ranges from calls for various immigration reforms to proposals to completely restrict immigration to one's nation; these often also include measures to combat immigration of existing citizens. Some critics of immigration argue that the presence of immigrants may distort the national identity of the native population. That means that the native population opposes immigration because they fear they may lose their sense of belonging to their own nation, as represented by distinctive traditions, culture, language and politics. National identity can be an important factor for social peace in cases where there are intra-national divides. For example, a 2015 study showed that the educational content of Suharto's Indonesia emphasizing the national unity of Indonesia was an important cause of improved inter-ethnic and inter-religious relationships. Immigrants may isolate themselves in their own communities, forming self-organized communities, ghettos or parallel societies where they live according to their own culture, rather than assimilating to the native culture with a reduced or minimal spatial, social and cultural contact with the majority society into which they have immigrated. Such ethnic enclaves can be the result of humans naturally liking to be around people like themselves. They might not learn the local language and might eventually undermine the national unity, as well as the cultural and religious unity of the native country. Research by Jennifer Neal of Michigan State University suggests that ethnic enclaves promote social cohesion at the cost of decreasing tolerance between groups and that their size, autonomy and proximity are factors. Some also suggest to devolve more power to local communities. Immigration may adversely affect social and political stability. Economic arguments concentrate on competition for employment, and the higher burdens that some groups of immigrants may impose on social welfare systems, health systems, housing and public schools of the native state. For example, Denmark's strict immigration law reform has saved the country 6.7 billion euros compared to previous more permissive approach, according to a 2011 report from the Danish Integration Ministry. The following are more an argument against overpopulation than against immigration, but sometimes overpopulation is caused by immigration. Some people think there is a certain size of land needed to provide for a population ("environmental space"), e.g., to provide for the population's consumption, including absorption of waste products. Immigrants, in this logic, such as a new born child, reduce the per capita size of land of the native country. This idea dates back to Robert Malthus who claimed this in a similar way in the early 19th century. Some are concerned about urban sprawl and congestion, alterations in the wildlife and natural environment of the state, and an expansive carbon footprint due to immigration. Furthermore, some are concerned over a state's scarce resources, dwindling water reserves, energy, pauperized soils and solid waste. Immigrants (and cross-border movements in general) can bring infectious diseases uncommon to the native population from their home countries which some perceive as a threat of significance in opposition to immigration. Some point out that this threat is often overstated by opponents. Opponents of immigration often claim that immigrants contribute to higher crime rates, but research suggests that people tend to overestimate the relationship between immigration and criminality. The academic literature provides mixed findings for the relationship between immigration and crime worldwide, but finds for the United States that immigration either has no impact on the crime rate or that it reduces the crime rate. Some concerns regarding immigration can be found in perceived military loyalty, especially if the country of emigration becomes involved in a war with the country of immigration. Particularly if a country finds itself in the need of drafting. Opponents of immigration often state that immigrants have a net negative effect on public coffers mainly due to the provisioning of medical care and welfare. Various factors influence the impact of immigrants to a nation's public coffers and their use of welfare. While immigrants can improve a state's welfare system by for example counteracting trends of aging populations their net economic impact might also be negative. George Borjas, economics professor at Harvard's Kennedy School of Government, states that "the more unskilled the immigrant, the more likely the immigrant will be a fiscal burden". High-skilled immigrants have better labor market prospects than those admitted based on kinship ties or for humanitarian reasons. It also depends on the tenures, wages and ages of the immigrants and the country's integration system. Some opponents of immigration argue that immigration of highly skilled or well-educated individuals may hurt their home countries – which could otherwise benefit from them and build up their economy and improve their social and political system (i.e. brain drain). However, the notion of a "brain drain" remains largely unsupported in the academic literature. According to economist Michael Clemens, it has not been shown that restrictions on high-skill emigration reduce shortages in the countries of origin. According to development economist Justin Sandefur, "there is no study out there... showing any empirical evidence that migration restrictions have contributed to development." Hein de Haas, Professor of Sociology at the University of Amsterdam, describes the brain drain as a "myth". Research suggests that emigration (both low-and high-skilled) is beneficial to the sending countries in terms of economy, education, and liberal democracy. Immigration may be the outcome of problems in the migrants' countries of origin. Open immigration policies and efforts do not address these problems. However, just keeping borders closed does not address them either. Jeanne Park of the Council on Foreign Relations recommends European leaders to address the root causes of migration such as helping to broker an end to Syria's civil war, restoring stability to Libya, and upping aid to sub-Saharan Africa. According to her barring a political solution to these regional crises, Europe will continue to struggle with migrant inflows. Concerning the migratory and refugee movements in and from the Horn of Africa Günther Schröder notes that greater efforts are needed to deal with its causes. A report by the German Caritasverband states that only a long-term strategy that differentiates between combating the causes for migration in the countries of origin and the development of an EU migration policy will be able to find solutions. Responding to the root causes of illegal migration flows involves cooperation with third countries, including migrants' countries of origin and transit and might manifest itself in conflict prevention / peacekeeping and state building. It has been suggested that safe havens be created within the country of origin. It can be argued that immigration means that people "flee" of their country's problems instead of organizing, building up pressure, being involved in constructive foreign aid programs or otherwise addressing them. A 2017 study comprised 18,000 interviews across eleven countries: Australia, Canada, Denmark, France, Japan, Korea, Norway, Spain, Switzerland, United Kingdom and the United States. The study found that "higher-skilled immigrants are preferred to their lower-skilled counterparts at all levels of native socio-economic status (SES). There is little support for the Labor Market Competition hypothesis, since respondents are not more opposed to immigrants in their own SES stratum. While skin tone itself has little effect in any country, immigrants from Muslim-majority countries do elicit significantly lower levels of support, and racial animus remains a powerful force." A paper published in 2018 found that an influx of high-skilled immigration was associated with declines in nationalist voting, but that an influx in low-skilled immigration was associated with increases in nationalist voting in elections during the 2007-2016 period. A study of Europe found that immigrants themselves tend to hold more favorable views of immigration. The same study found no evidence that the native-born children of immigrants hold more favorable views of immigration. A 2017 study found that immigrants who stay in the country longer hold more negative views of immigration than those who have only been their for a brief period, possibly due to assimilating into native society and adopting its views. A 2014 review study in the Annual Review of Political Science found that "there is little accumulated evidence that citizens primarily form attitudes about immigration based on its effects on their personal economic situation. This pattern has held in both North America and Western Europe, in both observational and experimental studies." A study of Europe found the unemployed hold less favorable views towards immigration than the employed. Levels of education are one of the best predictors of support for anti-immigration policies and parties. A 2016 study published in the European Economic Review found, on the basis of European survey data in the period 2002-2012, that "higher levels of education lead to a more positive reported attitude toward immigrants". The authors suggest that this is explained by weaker economic competition between immigrants and educated natives, a higher aversion to discrimination among the educated, and a greater belief in the positive effects of immigration among the educated. A 2013 study in the American Journal of Political Science lends some support to the economic competition theory, as highly educated Americans who exhibit lower levels of xenophobia tend to support reductions in the number of highly skilled immigrants. A 2007 study in International Organization found that "people with higher levels of education and occupational skills are more likely to favor immigration regardless of the skill attributes of the immigrants in question. Across Europe, higher education and higher skills mean more support for all types of immigrants. These relationships are almost identical among individuals in the labor force, that is, those competing for jobs! and those not in the labor force." A 2018 study in the American Political Science Review found "an additional year of secondary schooling substantially reduces the probability of opposing immigration, believing that immigration erodes a country’s quality of life, and feeling close to far-right anti-immigration parties." One study of Japan found that exposure to information about the benefits of immigration substantially increased support for a more open immigration policy. A study by Alexander Janus investigated whether social desirability pressures may partially explain reduced opposition to immigration amongst the highly educated. Using an unobtrusive questioning technique, Janus found that anti-immigration sentiments amongst American college graduates were far higher than subjects were willing to state. This indicates that support for immigration amongst the better educated may reflect expression of socially desirable views rather than actual beliefs. Further evidence for this was found in a study by Creighton et al., where amongst the college educated, it was found the stated support for immigration was higher than the actual pro-immigrant sentiment. This was true for other education levels. The study also found that the 2008 economic crisis did not significantly increase anti-immigration attitudes but rather there was a greater expression of opposition to immigration, with underlying attitudes changing little before and after the crisis. A 2015 study found further evidence that support for immigration amongst the educated was mainly driven by social desirability bias. Some research suggests that geographic proximity to immigrants drives anti-immigration views, while other research shows the reverse. Other research suggests that it is the perception of proximity, not actual proximity, that drives these views. A 2017 study finds that "more rapid ethnic changes increase opposition to immigration and support for UKIP" in the United Kingdom. A 2018 study found that increases in local ethnic diversity in Denmark caused "rightward shifts in election outcomes by shifting electoral support away from traditional “big government” left‐wing parties and towards anti‐immigrant nationalist parties." A 2018 study in the American Political Science Review found that Greeks who had "direct exposure to refugee arrivals" showed more hostility "toward refugees, immigrants, and Muslim minorities; support for restrictive asylum and immigration policies; and political engagement to effect such exclusionary policies." Some research suggests that anti-immigration views are transmitted from older generations to younger generations. A 2017 study of Germany found "high association between fathers’ and sons’ right-wing extremist attitudes". A 2015 study found that British communities that were more acceptant of Jews in medieval times show much more tolerance towards 20th century immigrants (chiefly Caribbean and South Asian immigrants) and 21st century immigrants (chiefly Eastern European), and less support for the far right. A 2017 study in the American Political Science Review found that prejudice towards marginalized groups, such as refugees, could be explained by a failure to take the perspective of the marginalized group. The study found that young Hungarian adults who played a perspective-taking game (a game intended to reduce prejudice towards marginalized groups by having players assume the role of a member of a marginalized group) showed reduced prejudice towards Romani people and refugees, as well as reduced their vote intentions for Hungary's overtly racist, far right party by 10%. A 2017 study found that by emphasizing shared religion can produce more supportive attitudes toward refugees. A 2015 study of the US found that religion did not seem to determine opposition to immigration as while respondents were explicit about opposition to Muslim immigration, they also concealed significant opposition to Christian immigration due to social desirability bias. It was thus determined that religiosity or denomination did not determine explicit or implicit opposition and any differences were down to social desirability bias in this case. One 2018 study in the United Kingdom found that opposition to Muslim immigrants was not per se about a more negative view of Muslim (relative to Christian) immigrants but rather about a sense of unease about fundamentalist religiosity due to the perception that Muslims are more fundamentalist. The study concluded that opposition based on religion was thus less about the religious group and more about political liberalism versus religious fundamentalism. A 2014 review study in the Annual Review of Political Science found that there is substantial evidence in support of sociopsychological explanations for anti-immigration views. A 2007 study in International Organization found that "the link between education and attitudes toward immigrants is driven by differences among individuals in cultural values and beliefs. More educated respondents are significantly less racist and place greater value on cultural diversity than do their counterparts; they are also more likely to believe that immigration generates benefits for the host economy as a whole." A 2017 study in the American Political Science Review argued that hostility towards immigrants is driven by disgust and can be explained as a psychological mechanism designed to protect humans from disease. Research suggests that the perception that there is a positive causal link between immigration and crime leads to greater support for anti-immigration policies or parties. Research also suggests that bigotry and immigrant alienation could exacerbate immigrant criminality and bigotry. For instance, University of California, San Diego political scientist Claire Adida, Stanford University political scientist David Laitin and Sorbonne University economist Marie-Anne Valfort argue "fear-based policies that target groups of people according to their religion or region of origin are counter-productive. Our own research, which explains the failed integration of Muslim immigrants in France, suggests that such policies can feed into a vicious cycle that damages national security. French Islamophobia—a response to cultural difference—has encouraged Muslim immigrants to withdraw from French society, which then feeds back into French Islamophobia, thus further exacerbating Muslims’ alienation, and so on. Indeed, the failure of French security in 2015 was likely due to police tactics that intimidated rather than welcomed the children of immigrants—an approach that makes it hard to obtain crucial information from community members about potential threats." A study of the long-run effects of the 9/11 terrorist attacks in the United States found that the post-9/11 increase in hate crimes against Muslims decreased assimilation by Muslim immigrants. Controlling for relevant factors, the authors found that "Muslim immigrants living in states with the sharpest increase in hate crimes also exhibit: greater chances of marrying within their own ethnic group; higher fertility; lower female labour force participation; and lower English proficiency." A study of Germans found that the 9/11 terror attacks contributed to greater anti-immigrant sentiments. States that experience terrorist acts on their own soil or against their own citizens are more likely to adopt stricter restrictions on asylum recognition. In 2018, a survey of 27 countries around the world showed that a median of 45% wanted fewer or no immigrants, 36% wanted to keep the current immigration levels and only 14% wanted immigration to increase. The median of those opposing was the highest in countries receiving the most migrants, with 51% in European countries. Pauline Hanson, in her maiden speech in 1996, said that Australia "was in danger of being swamped by Asians". The impact of Europeans was profoundly disruptive to Aboriginal life and, though the extent of violence is debated, there was considerable conflict on the frontier. At the same time, some settlers were quite aware they were usurping the Aborigines place in Australia. In 1845, settler Charles Griffiths sought to justify this, writing; "The question comes to this; which has the better right – the savage, born in a country, which he runs over but can scarcely be said to occupy ... or the civilized man, who comes to introduce into this ... unproductive country, the industry which supports life." Many events illustrate violence and resistance as Aborigines sought to protect their lands from invasion and as settlers and pastoralists attempted to establish their presence. In May 1804, at Risdon Cove, Van Diemen's Land, perhaps 60 Aborigines were killed when they approached the town. A sparsely-populated continental nation with a predominantly European population, Australia has long feared being overwhelmed by the heavily populated Asian countries to its north. The standard policy after 1900 was "White Australia" which encouraged immigration from Britain, was suspicious of immigrants from Germany and elsewhere in Europe, and which was quite hostile to immigrants from Asia or the Pacific islands. After World War II, most Australians agreed that the country must "populate or perish". Immigration brought people from traditional sources such as the British Isles along with, for the first time, large numbers of Southern and Central Europeans. The abolition of the so-called 'White Australia policy' during the early 1970s led to a significant increase in immigration from Asian and other non-European countries. Prime Minister John Curtin supported White Australia policy, saying "This country shall remain forever the home of the descendants of those people who came here in peace in order to establish in the South Seas an outpost of the British race." Prime Minister Stanley Bruce was a supporter of the White Australia Policy, and made it an issue in his campaign for the 1925 Australian Federal election. You have always insisted on the right to determine the composition of your own people. Australia wants that right now. What you are attempting to do now, Japan attempted after the last war [the First World War] and was prevented by Australia. Had we opened New Guinea and Australia to Japanese immigration then the Pacific War by now might have ended disastrously and we might have had another shambles like that experienced in Malaya. I am proud of my white skin, just as a Chinese is proud of his yellow skin, a Japanese of his brown skin, and the Indians of their various hues from black to coffee-coloured. Anybody who is not proud of his race is not a man at all. And any man who tries to stigmatize the Australian community as racist because they want to preserve this country for the white race is doing our nation great harm... I reject, in conscience, the idea that Australia should or ever can become a multi-racial society and survive. It was the high-profile historian Geoffrey Blainey, however, who first achieved mainstream recognition for the anti-multiculturalist cause when he wrote that multiculturalism threatened to transform Australia into a "cluster of tribes". In his 1984 book All for Australia, Blainey criticised multiculturalism for tending to "emphasise the rights of ethnic minorities at the expense of the majority of Australians" and also for tending to be "anti-British", even though "people from the United Kingdom and Ireland form the dominant class of pre-war immigrants and the largest single group of post-war immigrants." According to Blainey, such a policy, with its "emphasis on what is different and on the rights of the new minority rather than the old majority," was unnecessarily creating division and threatened national cohesion. He argued that "the evidence is clear that many multicultural societies have failed and that the human cost of the failure has been high" and warned that "we should think very carefully about the perils of converting Australia into a giant multicultural laboratory for the assumed benefit of the peoples of the world." For the millions of Australians who have no other nation to fall back upon, multiculturalism is almost an insult. It is divisive. It threatens social cohesion. It could, in the long-term, also endanger Australia's military security because it sets up enclaves which in a crisis could appeal to their own homelands for help. Blainey remained a persistent critic of multiculturalism into the 1990s, denouncing multiculturalism as "morally, intellectually and economically ... a sham". In the 1996 election Pauline Hanson was elected to the federal seat of Oxley. In her controversial maiden speech to the House of Representatives, she expressed her belief that Australia "was in danger of being swamped by Asians". Hanson went on to form the One Nation Party, which initially won nearly one quarter of the vote in Queensland state elections before entering a period of decline due to internal disputes. The name "One Nation" was meant to signify national unity, in contrast to what Hanson claimed to see as an increasing division in Australian society caused by government policies favouring migrants (multiculturalism) and indigenous Australians. Some Australians reacted angrily to One Nation, as Hanson was subjected to water balloons filled with urine at public speeches, ridiculed in the media, and received so many death threats she filmed a "good-bye video" in the case of her assassination. She was imprisoned by the government on political corruption charges, which were dropped after her imprisonment. In recent years the rise of other anti-immigrant parties such as the Australian Liberty Alliance and groups such as the United Patriot Front indicates that anti-immigration sentiment may be becoming mainstream. A February 2017 poll of 10 000 people in 10 Eurpean countries by Chatham House found on average a majority (55%) were opposed to further Muslim immigration, with opposition especially pronounced in a number of countries: Austria (65%), Poland (71%), Hungary (64%), France (61%) and Belgium (64%). Except for Poland, all of those had recently suffered jihadist terror attacks or been at the centre of a refugee crisis. Of those opposed to further Muslim immigration, 3/4 classify themselves as on the right of the political spectrum. Of those self-classifying as on the left of the political spectrum, 1/3 supported a halt. Ackording to a Yougov poll in 2018, majorities in all seven polled countries were opposed to accepting more migrants: Germany (72%), Denmark (65%), Finland (64%), Sweden (60%), United Kingdom (58%), France (58%) and Norway (52%). Political opposition to high levels of legal immigration has been associated with certain right-wing parties in the EU. The issue flared up with the European migrant crisis in 2015 with large numbers of refugees from the Middle East and Africa making dangerous trips to Europe and many deaths en route. With high levels of unemployment and partly unassimilated non-European immigrant populations already within the EU, parties opposed to immigration have improved their position in polls and elections. Right-wing parties critical to immigration have entered the government in Austria, Denmark, Italy, The Netherlands, Norway, Poland and Slovakia, and have become major factors in English, Swedish, German and French politics. According to poll published by Corriere della Serra, one of two respondents (51%) approved closing Italy's ports to further boat migrants arriving via the Mediterranean, while 19% welcomed further boat migrants. In 2018, a poll by Pew Research found that a majority (71%) wanted fewer immigrants to be allowed into the country, 18% wanted to keep the current level and 5% wanted to increase immigration. A January 2004 survey by Spanish newspaper El País showed that the "majority" of Spaniards believe immigration was too high. In Spain, surveys show "in descending order, jobs, crime and housing" as the primary concerns for citizens opposed to immigration. Small Neo-fascist parties, such as Movimiento Social Español, openly campaign using nationalist or anti-immigrant rhetoric as do other small far-right parties such as National Democracy (Spain) and España 2000. These parties have never won national or regional parliamentary seats. A 2008 study which involved questionnaires to 5000 people, showed that less than a quarter of the respondents (23%) wanted to live in areas characterised by cultural, ethnic and social diversity. A 2016 SOM Institute survey published by University of Gothenburg reported that between the years 2011 and 2016, the estimated share of people with concerns about the increasing number of immigrants increased from around 20% to 45%. In the period 2014-2016. In 2018, a poll by Pew Research found that a small majority (52%) wanted fewer immigrants to be allowed into the country, 33% wanted to keep the current level and 14% wanted to increase immigration. On the question of repatriation of the asylum immigrants, 61% of native respondents in 1990 thought that it was a good suggestion, with this figure steadily decreasing over the ensuing years to a low of around 40% in 2014. In 2015, there was an increase in respondents in favor of repatriation; 52% deemed it a good suggestion. The proportion of respondents who felt repatriation was neither a good nor bad proposal simultaneously dropped from almost 40% to 24%. In the UK the British National Party made opposition to immigration one of their central policies in the 2010 general election. The anti-mass-immigration party, UKIP, have proposed setting up a Migration Control Commission, tasked with bringing down net migration. The Conservative Party pledged to bring immigration from the EU and rest of the world down to the "tens of thousands", with a range of welfare restrictions and housing restrictions. The vote for the UK to leave the EU was successful in Britain, with a number of commentators suggesting that populist concern over immigration from the EU was a major feature of the public debate. British Prime Minister David Cameron resigned over the vote. In 2006, Cameron dismissed UKIP supporters as "fruitcakes, loonies and closet racists, mostly" though later conceded to hold a vote on leaving the EU, due in part to the Conservative party losing votes to UKIP. The current Prime Minister Theresa May introduced an Immigration Skills Charge in April 2017, on companies who employ skilled non-EU immigrants, of £1000 per immigrant employee; small or charitable organizations pay a reduced amount of £364. The money is to be used to help fund apprenticeships and skills training for people from the UK and EU. In her 2017 UK General Election manifesto, the Prime Minister promised to double the Immigration Skills Charge to £2000 per employee, if re-elected. EU law prevents the charge being applied in relation to immigrants from the EU (or limiting the apprenticeships to people from the UK); the prime minister has promised that after Brexit there will also be restrictions on migration from the EU. In 2012, Israel constructed a barrier on its border with Egypt which reduced the number of illegal immigrants crossing the border into Israel, from 7004160000000000000♠16000 in 2011 to fewer than 20 in 2016 which represents a decrease of 99%. The government tried offering money to migrants to encourage them to return to their countries of origin, while the Supreme Court blocked the government's attempts to deport them. In December 2017, the parliament approved legislation which would allow the government to overrulle the Supreme Court deport 7004400000000000000♠40000 illegal immigrants. In the preceding decade, some 7004600000000000000♠60000illegal immigrants entered Israel by crossing the border with Egypt. Some were legitimate refugees, most were economic migrants. India has anti-immigrant parties at the state level. The most common anti-immigrant parties are there in the state of Maharashtra, where the two main anti-immigrant parties are Shiv Sena and the Maharashtra Navnirman Sena. Both parties share the idea of migrants from North India stealing jobs from the native Marathi people in Maharashtra. They even have a history of attacking immigrants, who they accuse of being involved in crimes around Mumbai. Shiv Sena also has a history of threatening the Pakistani cricket team from coming to Mumbai and also threatening Australian cricket players in the Indian Premier League cricket competition following the racist attacks on India students in Australia in 2009. Even in the last few decades, there has been a rise in the anti-Immigrant attitudes in the North East Indian states like Assam, which has received illegal immigrants from neighboring Bangladesh. Riots have occurred between the native tribes of Assam who are Hindus and the illegal immigrants from Bangladesh, who are predominantly Muslims. The movement for Japanese cultural isolation, sakoku (鎖 国), arose in Edo period Japan, in response to the strong influence of Western culture, especially Slavery in Portugal. The study of (ancient) Japanese literature and culture was called kokugaku (国 学, "country study"). Brazil is a country of immigrants and developed a reputation for "warm welcome" of people all over the world. Nevertheless, different analysts often dispute how truthful this image is and, although openly xenophobic manifestation were uncommon, some scholars denounce it existence in more subtle ways. Despite the fact that Brazil was considered a safe haven for neighboring refugees and immigrants, xenophobic violence has erupted. Brazil received up to 3000 Syrian refugees becoming the largest receiver of such in Latin America. However xenophobic and islamophobic attacks were reported against Syrian refugees and Muslims in general. After the alleged beating of a shop owner during a robbery by alleged Venezuelan migrants, riots occurred in the Brazilian-Venezuelan border which included attacks on Venezuelans nationals, destruction of refugee tends and fires. 1200 Venezuelans went back to their homeland as a result and President Michel Temer's government increased military personal in the border. The burning of the refugee camps was reported in national and international news outlet and the authorities announce they will investigate and prosecute the authors. However anti-migration far-right candidate Jair Bolsonaro won the recent Brazilian general election, 2018. In L'Express, the French news magazine, Canadian academic, and environmental activist David Suzuki called Canada's immigration policy "disgusting" (We "plunder southern countries to deprive them of their future leaders, and wish to increase our population to support economic growth") and insisted that "Canada is full" ("Our useful area is reduced"), even though Canada has one of the smallest population densities in the world. In a 2017 poll, the majority of Canadians indicated that they agree that Canada should accept fewer immigrants and refugees. Anti-immigrant feelings date back to late 19th century and early 20th century with the country's first waves of migrations from places like China, Lebanon and Poland. Non-Polish European migration dates back to practically the independence from Spain but was generally well received. Polish migration was mostly Jewish thus the backlash was due to anti-Semitism. Records of the time show Chinese migrants as the most affected by prejudice especially from government official and the first anti-Chinese laws were enacted as far back as the 1910s. In 1903 President Ascensión Esquivel Ibarra enacted one of the first decrees forbidding non-White immigration and explicitly stating that migration from Asians, Blacks, Gypsies, Arabs and Turks was not allowed. Although this laws were common in Latin America at the time, and Costa Rica's government eventually became the lead force in its abolishment. Polish, Chinese and Lebanese migrants would integrate fully into Costa Rican society with time to the point that many prominent Costa Ricans from industry, politics, arts, academy, etc. are of those descents. Latin American migrants became the next source of mistrust and opposition, especially Nicaraguan and Colombian migrants. During the second half of the 20th century and to this date Costa Rica receives numerous waves of Latin American migrants from all the region, but Nicaraguans are by far the higher group among immigrant population encompassing 74.6% of the immigrant population, followed by Colombians and Americans (immigrants in general are 9% of the population) making ethnic Nicaraguans and binational Nicaraguan-Costa Rican citizens one of the most notorious ethnic minorities in Costa Rica outnumbering other groups like African-Costa Ricans. This caused debate in the country with some voices claiming for harder regulations and border control. The issue was one of the main topics of the 2002's political campaign, and was again important for the 2018's campaign with right-wing politicians like Otto Guevara quoting Donald Trump as an inspiration and calling for harsher migratory laws and eliminating the citizenship by birth in the Constitution. The Migration Law was reform globally in 2005 hardening some of the requirements for entering, staying and working on the country which was criticized as excessive, but further reforms, the last one in 2009, reduce some of the impact of the more controversial parts of the law. Far-right ultra-convervative National Restoration Party that held an important role in the most recent presidential election also holds anti-migration positions. After a series of fake news spread by several far-right Facebook pages inciting hatred against Nicaraguan migrants, an anti-migration manifestation was organized on 18 August 2018 known as the "Taken of La Merced" after Nicaraguan refugees were falsely accused of having “taking” La Merced Park in San Jose, a common gathering of the Nicaraguan community. Although some of the protesters were peaceful, participation of openly neo-Nazi groups and violent hooligans with criminal records caused riots and attacks on Nicaraguans or people suspected of being. The national police Public Force intervened with up to 44 people arrested, 36 of such were Costa Rican and the rest Nicaraguans. Several violent articles including Molotov bombs were confiscated and some of the protesters identify themselves with Swastikas and yelled "¡Fuera nicas!" (Nicas out!). A pro-immigrant manifestation was scheduled a week later with a high attendance. Further anti-migration protests (this time with the explicit exclusion of hooligans and neo-nazi) were organized in later days but with lesser participation. In Mexico, during the first eight months of 2005, more than 120,000 people from Central America were deported to their countries of origin. This is a much higher number than the people deported in the same period in 2002, when only 1 person was deported in the entire year. Many women from countries in the Commonwealth of Independent States (most of former USSR), Asia and Central and South America are offered jobs at table dance establishments in large cities throughout the country, causing the National Institute of Migration (INM) in Mexico to raid strip clubs and deport foreigners who work without the proper documentation. Mexico has very strict laws pertaining to both illegal and legal immigrants. The Mexican constitution restricts non-citizens or foreign-born persons from participating in politics, holding office, acting as a member of the clergy, or serving on the crews of Mexican-flagged ships or airplanes. Certain legal rights are waived, such as the right to a deportation hearing or other legal motions. In cases of flagrante delicto, any person may make a citizen's arrest on the offender and his accomplices, turning them over without delay to the nearest authorities. Many immigration restrictionists in the United States have accused the Mexican government of hypocrisy in its immigration policy, noting that while the Government of Mexico and Mexican Americans are demanding looser immigration laws in the United States and oppose the 2010 Arizona Immigration Bill, at the same time Mexico is imposing even tighter restrictions on immigration into Mexico from Central America and other places than the Arizona law. However, Mexico started enforcing those laws which they previously ignored at the direct request of the United States, which saw a surge of Central American immigration during the Bush years; the newly elected president of Mexico has stated his desire to be more open, and would not deport Central Americans on their way to the United States or those who wish to remain in Mexico. The recent exodus of Venezuelan migrants in Panama encouraged the xenophobic and anti-migration public speech from Panamanian nationalist groups. 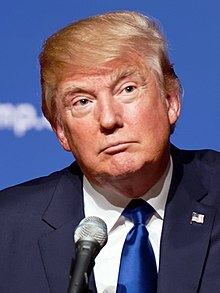 Donald Trump campaigned for president in 2016 by promising to build a wall on the border of Mexico and the United States "as the centerpiece of his immigration plan". In the United States of America, opponents of immigration typically focus on perceived adverse effects, such as economic costs (job competition and burdens on education and social services); negative environmental impact from accelerated population growth; increased crime rates, and in the long run, changes in traditional identities and values. In countries where the majority of the population is of immigrant descent, such as the United States, opposition to immigration sometimes takes the form of nativism. In the United States, opposition to immigration has a long history, starting in the late 1790s, in reaction to an influx of political refugees from France and Ireland. The Alien and Sedition Acts of 1798 severely restricted the rights of immigrants. Nativism first gained a name and affected politics in the mid-19th century United States because of the large inflows of immigrants from cultures that were markedly different from the existing Protestant culture. Nativists objected primarily to Roman Catholics, especially Irish Americans. Nativist movements included the American Party of the mid-19th Century (formed by members of the Know-Nothing movement), the Immigration Restriction League of the early 20th Century, and the anti-Asian movements in the West, resulting in the Chinese Exclusion Act and the so-called "Gentlemen's Agreement" which was aimed at the Japanese. Major restrictions became law in the 1920s and sharply cut the inflow until 1965, when they ended. The federal government took charge of finding and deporting illegal aliens, which it still does. Immigration again became a major issue from the 1990s onward, with burgeoning undocumented immigration, particularly by Mexicans crossing the Southern border, and others who overstayed their visitor visas. The Immigration Reform and Control Act of 1986 provided an amnesty which was described as the amnesty to end all amnesties but it had no lasting impact on the flow of illegal immigrants. What started five years ago as a groundswell of conservatives committed to curtailing the reach of the federal government, cutting the deficit and countering the Wall Street wing of the Republican Party has become a movement largely against immigration overhaul. The politicians, intellectual leaders and activists who consider themselves part of the Tea Party movement have redirected their energy from fiscal austerity and small government to stopping any changes that would legitimize people who are here illegally, either through granting them citizenship or legal status. As of 2014, there were over 42.4 million immigrants living in the United States. This was about 13.3% of the entire United States population at that time. The American Federation of Labor (AFL), a coalition of labor unions formed in the 1880s, vigorously opposed unrestricted immigration from Europe for moral, cultural, and racial reasons. The issue unified the workers who feared that an influx of new workers would flood the labor market and lower wages. Nativism was not a factor because upwards of half the union members were themselves immigrants or the sons of immigrants from Ireland, Germany and Britain. However, nativism was a factor when the AFL even more strenuously opposed all immigration from Asia because it represented (to its Euro-American members) an alien culture that could not be assimilated into American society. The AFL intensified its opposition after 1906 and was instrumental in passing immigration restriction bills from the 1890s to the 1920s, such as the 1921 Emergency Quota Act and the Immigration Act of 1924, and seeing that they were strictly enforced. Mink (1986) concludes that the link between the AFL and the Democratic Party rested in part on immigration issues, noting the large corporations, which supported the Republicans, wanted more immigration to augment their labor force. United Farm Workers during Cesar Chavez tenure was committed to restricting immigration. Chavez and Dolores Huerta, cofounder and president of the UFW, fought the Bracero Program that existed from 1942 to 1964. Their opposition stemmed from their belief that the program undermined U.S. workers and exploited the migrant workers. Since the Bracero Program ensured a constant supply of cheap immigrant labor for growers, immigrants could not protest any infringement of their rights, lest they be fired and replaced. Their efforts contributed to Congress ending the Bracero Program in 1964. In 1973, the UFW was one of the first labor unions to oppose proposed employer sanctions that would have prohibited hiring illegal immigrants. On a few occasions, concerns that illegal immigrant labor would undermine UFW strike campaigns led to a number of controversial events, which the UFW describes as anti-strikebreaking events, but which have also been interpreted as being anti-immigrant. In 1969, Chavez and members of the UFW marched through the Imperial and Coachella Valleys to the border of Mexico to protest growers' use of illegal immigrants as strikebreakers. Joining him on the march were Reverend Ralph Abernathy and U.S. Senator Walter Mondale. In its early years, the UFW and Chavez went so far as to report illegal immigrants who served as strikebreaking replacement workers (as well as those who refused to unionize) to the Immigration and Naturalization Service. ...a right-wing proposal, which says essentially there is no United States...you're doing away with the concept of a nation-state. What right-wing people in this country would love is an open-border policy. Bring in all kinds of people, work for $2 or $3 an hour, that would be great for them. I don’t believe in that. I think we have to raise wages in this country, I think we have to do everything we can to create millions of jobs. Several periods of violent riots against migrants have occurred in South Africa in the past decade, some resulting in fatalities. Countries from which the migrants targeted originated include Malawi, Mozambique and Zimbabwe. In March 2019, groups armed with machetes broke into the homes of migrants in Durban. At least six people were killed, several were wounded and their homes were looted. At least 300 malawi migrants were forced to leave the country. In separate attacks, foreign truck drivers were forced out of their vehicles and were attacked with knives. On 2 April 2019, another group of migrants in Durban was attacked[by whom?] and forced to flee their homes. The escalating violence added tension to the upcoming 2019 South African general election. ^ a b Kozak, Krystof. "Are Immigrants Disloyal? The Case of Mexicans in the U.S." European Association for American Studies. European Association for American Studies. Retrieved 20 July 2016. ^ "Definition of National Identity in English". Oxford Dictionaries. ^ a b c "End of nations: Is there an alternative to countries?". New Scientist. Retrieved 10 May 2017. ^ Sobel, Andrew (2009-09-10). Challenges of Globalization: Immigration, Social Welfare, Global Governance. Routledge. ISBN 9781135216955. Retrieved 10 May 2017. ^ "Immigration and political stability" (PDF). Retrieved 10 May 2017. ^ Beckett, Andy (9 February 2016). "Is Britain full? Home truths about the population panic" – via The Guardian. ^ Reimann, Anna (29 April 2011). "Putting a price on foreigners: strict immigration laws 'Save Denmark Billions'". spiegel.de. Spiegel Online. Retrieved 14 September 2014. ^ "Denmark's immigration laws save country £6 billion". The Daily Telegraph. Telegraph Media Group. Retrieved 14 September 2014. ^ "The UK's population problem" (PDF). ^ a b Rohe, John F (1 January 2006). "Living Standards, Scarce Resources and Immigration: An Interview With Labor Economist Vernon M. Briggs, Jr". Retrieved 28 January 2017. ^ Dhooper, Surjit Singh (2011-11-29). Social Work in Health Care: Its Past and Future. SAGE Publications. ISBN 9781483342573. Retrieved 12 February 2017. ^ Brown, Diane; Edwards, Helen; Seaton, Lesley; Buckley, Thomas (2015-01-29). Lewis's Medical-Surgical Nursing: Assessment and Management of Clinical Problems. Elsevier Health Sciences. ISBN 9780729582209. Retrieved 12 February 2017. ^ a b Epidemiology for Public Health Practice. Jones & Bartlett Publishers. 2009-05-18. ISBN 9781449666637. Retrieved 10 May 2017. ^ "U.S. – Mexico Cross-Border Health". www.cdc.gov. Gateway to Health Communication | CDC. Retrieved 12 February 2017. ^ Gushulak, B. D.; MacPherson, D. W. (15 June 2004). "Globalization of Infectious Diseases: The Impact of Migration". Clinical Infectious Diseases. 38 (12): 1742–1748. doi:10.1086/421268. Retrieved 12 February 2017. ^ Wilder-Smith, Annelies; Shaw, Marc; Schwartz, Eli (2007-06-07). Travel Medicine: Tales Behind the Science. Routledge. ISBN 9781136352157. Retrieved 12 February 2017. ^ Lirola, Maria Martinez (2014-08-11). Discourses on Immigration in Times of Economic Crisis: A Critical Perspective. Cambridge Scholars Publishing. ISBN 9781443865609. Retrieved 12 February 2017. ^ "Polish opposition warns refugees could spread infectious diseases". Reuters. 15 October 2016. Retrieved 13 February 2017. ^ Bruce, Tammy. "When foreigners bring disease across the border". The Washington Times. Retrieved 13 February 2017. ^ a b "The Mexican 'germ invasion' is just the right's latest anti-immigration myth". The Guardian. 2 July 2014. Retrieved 13 February 2017. ^ "America's puzzling moral ambivalence about Middle East refugees". Brookings. 28 June 2016. Retrieved 26 January 2017. ^ Jaitman, Laura; Machin, Stephen (25 October 2013). "Crime and immigration: new evidence from England and Wales". IZA Journal of Migration. 2 (1): 1–23. doi:10.1186/2193-9039-2-19. ISSN 2193-9039. ^ a b Bell, Brian; Fasani, Francesco; Machin, Stephen (10 October 2012). "Crime and Immigration: Evidence from Large Immigrant Waves". Review of Economics and Statistics. 95 (4): 1278–1290. doi:10.1162/REST_a_00337. ISSN 0034-6535. ^ Wadsworth, Tim (1 June 2010). "Is Immigration Responsible for the Crime Drop? An Assessment of the Influence of Immigration on Changes in Violent Crime Between 1990 and 2000". Social Science Quarterly. 91 (2): 531–553. doi:10.1111/j.1540-6237.2010.00706.x. ISSN 1540-6237. ^ Piopiunik, Marc; Ruhose, Jens (6 April 2015). "Immigration, Regional Conditions, and Crime: Evidence from an Allocation Policy in Germany". SSRN 2589824. ^ "Dangerous journeys – International migration increasingly unsafe in 2016" (PDF). Retrieved 26 January 2017. ^ Grant, Martin Chulov Harriet (13 January 2014). "EU must open doors to avoid Syrian refugee catastrophe, says UN". The Guardian. Retrieved 26 January 2017. ^ Perspectives on Global Development 2017 International Migration in a Shifting World: International Migration in a Shifting World. OECD Publishing. 2016-12-12. ISBN 9789264265684. Retrieved 26 January 2017. ^ "The Refugee Crisis and Europe". RUSI. Retrieved 26 January 2017. ^ "Danger every step of the way" (PDF). UNICEF. Retrieved 26 January 2017. ^ "Australia asylum: Why is it controversial?". BBC News. 3 August 2016. Retrieved 26 January 2017. ^ "Anti-immigration mood weighs on EU politicians". Financial Times. Retrieved 26 January 2017. ^ Office, The Stationery (2015-11-03). HL 46 – EU Action Plan against migrant smuggling. The Stationery Office. ISBN 9780108558207. Retrieved 26 January 2017. ^ Farrell, Paul (22 April 2015). "Could Australia's 'stop the boats' policy solve Europe's migrant crisis?". The Guardian. Retrieved 26 January 2017. ^ "The gifts of immigration". Harvard Gazette. Retrieved 26 January 2017. ^ Swain, Laksha P. (2006). Migration and Adjustment. Northern Book Centre. ISBN 9788172112110. Retrieved 26 January 2017. ^ Flores, Juan; Flores, Prof of Social and Cultural Analysis Juan (2010-04-02). The Diaspora Strikes Back: Caribeño Tales of Learning and Turning. Routledge. ISBN 9781135927592. Retrieved 26 January 2017. ^ Chuang, Susan S. (2011-06-16). Immigrant Children: Change, Adaptation, and Cultural Transformation. Lexington Books. ISBN 9780739167069. Retrieved 26 January 2017. ^ "Muslims in France: Identifying a Discriminatory Equilibrium" (PDF). Retrieved 10 May 2017. ^ Rozell, Mark J.; Jelen, Ted G. (2015-04-28). American Political Culture: An Encyclopedia [3 volumes]: An Encyclopedia. ABC-CLIO. ISBN 9781610693783. Retrieved 26 January 2017. ^ Chapman, Roger; Ciment, James (2015-03-17). Culture Wars: An Encyclopedia of Issues, Viewpoints and Voices. Routledge. ISBN 9781317473510. Retrieved 26 January 2017. ^ Rahim, Abdur (2014-09-19). Canadian Immigration and South Asian Immigrants. Xlibris Corporation. ISBN 9781499058727. Retrieved 26 January 2017. ^ Congress, Elaine P.; Gonzalez, Manny J. (2005-04-15). Multicultural Perspectives in Working with Families: Second Edition. Springer Publishing Company. ISBN 9780826131461. Retrieved 26 January 2017. ^ Nyangweso, Mary (2014-10-20). Female Genital Cutting in Industrialized Countries: Mutilation or Cultural Tradition?. ABC-CLIO. ISBN 9781440833472. Retrieved 26 January 2017. ^ "Immigration and the Welfare State" (PDF). Cato Journal. Retrieved 12 February 2017. ^ "The Cost of Welfare Use By Immigrant and Native Households". Center for Immigration Studies. 6 May 2016. Retrieved 12 February 2017. ^ Sowell, Thomas (2008-12-09). Applied Economics: Thinking Beyond Stage One. Basic Books. ISBN 0786722703. Retrieved 25 January 2017. ^ Bommes, Michael; Geddes, Andrew (2003-09-02). Immigration and Welfare: Challenging the Borders of the Welfare State. Routledge. ISBN 9781134593705. Retrieved 25 January 2017. ^ "Report: More than half of immigrants on welfare". USA TODAY. Retrieved 25 January 2017. ^ "Germany Announces Crackdown on Immigrant 'Welfare Abuse' | VICE News". VICE News. Retrieved 12 February 2017. ^ "The Welfare Use of Immigrants and Natives in Germany: The Case of Turkish Immigrants" (PDF). Retrieved 25 January 2017. ^ "The Impact of Immigration on Germany's Society" (PDF). Federal Office for Migration and Refugees. 2005. Retrieved 12 February 2017. ^ "Refugee immigration and public finances in Sweden" (PDF). Retrieved 10 May 2017. ^ Horn, Heather. "The Economics—and Morality—of Admitting Refugees". The Atlantic. Retrieved 12 February 2017. ^ a b "Skill-based immigration, economic integration, and economic performance" (PDF). Retrieved 10 May 2017. ^ "Economic Impacts of Immigration: A Survey". Retrieved 10 May 2017. ^ "Migration and Development: Who Bears the Burden of Proof? Justin Sandefur replies to Paul Collier | From Poverty to Power". oxfamblogs.org. Retrieved 3 July 2016. ^ "Myths of Migration: Much of What We Think We Know Is Wrong". Spiegel Online. Retrieved 23 March 2017. ^ di Giovanni, Julian; Levchenko, Andrei A.; Ortega, Francesc (1 February 2015). "A Global View of Cross-Border Migration". Journal of the European Economic Association. 13 (1): 168–202. doi:10.1111/jeea.12110. ISSN 1542-4774. ^ Andreas, Willenbockel, Dirk; Sia, Go, Delfin; Amer, Ahmed, S. (11 April 2016). "Global migration revisited : short-term pains, long-term gains, and the potential of south-south migration". ^ "The Gain from the Drain – Skill-biased Migration and Global Welfare" (PDF). ^ Foley, C. Fritz; Kerr, William R. (2013). "Ethnic Innovation and U.S. Multinational Firm Activity". Management Science. 59 (7): 1529–1544. doi:10.1287/mnsc.1120.1684. ^ Javorcik, Beata S.; Özden, Çaglar; Spatareanu, Mariana; Neagu, Cristina (1 January 2011). "Migrant networks and foreign direct investment". Journal of Development Economics. 94 (2): 231–241. doi:10.1016/j.jdeveco.2010.01.012. ^ Tong, Sarah Y. (1 November 2005). "Ethnic Networks in FDI and the Impact of Institutional Development". Review of Development Economics. 9 (4): 563–580. doi:10.1111/j.1467-9361.2005.00294.x. ISSN 1467-9361. ^ Hillel Rapoport (20 September 2016). "Migration and globalization: what's in it for developing countries?". International Journal of Manpower. 37 (7): 1209–1226. doi:10.1108/IJM-08-2015-0116. ISSN 0143-7720. ^ Shrestha, Slesh A. (1 April 2016). "No Man Left Behind: Effects of Emigration Prospects on Educational and Labour Outcomes of Non-migrants". The Economic Journal. 127 (600): n/a–n/a. doi:10.1111/ecoj.12306. ISSN 1468-0297. ^ Beine, Michel; Docquier, Fréderic; Rapoport, Hillel (1 April 2008). "Brain Drain and Human Capital Formation in Developing Countries: Winners and Losers". The Economic Journal. 118 (528): 631–652. doi:10.1111/j.1468-0297.2008.02135.x. ISSN 1468-0297. ^ Dinkelman, Taryn; Mariotti, Martine (2016). "The Long Run Effects of Labor Migration on Human Capital Formation in Communities of Origin". American Economic Journal: Applied Economics. 8 (4): 1–35. doi:10.1257/app.20150405. ^ Batista, Catia; Lacuesta, Aitor; Vicente, Pedro C. (1 January 2012). "Testing the 'brain gain' hypothesis: Micro evidence from Cape Verde". Journal of Development Economics. 97 (1): 32–45. doi:10.1016/j.jdeveco.2011.01.005. ^ "Skilled Emigration and Skill Creation: A quasi-experiment – Working Paper 152". Retrieved 3 July 2016. ^ "Human Capital Investment under Exit Options: Evidence from a Natural Quasi-Experiment - Working Paper 152". Center For Global Development. Retrieved 2019-03-12. ^ "Can emigration lead to political change in poor countries? It did in 19th century Sweden: Guest Post by Mounir Karadja". Impact Evaluations. Retrieved 4 December 2015. ^ Tuccio, Michele; Wahba, Jackline; Hamdouch, Bachir (1 January 2016). "International Migration: Driver of Political and Social Change?". Institute for the Study of Labor (IZA). ^ a b "Migration, Political Institutions, and Social Networks in Mozambique". ^ Batista, Catia; Vicente, Pedro C. (1 January 2011). "Do Migrants Improve Governance at Home? Evidence from a Voting Experiment". The World Bank Economic Review. 25 (1): 77–104. doi:10.1093/wber/lhr009. ISSN 0258-6770. ^ Mahmoud, Omar; Toman; Rapoport, Hillel; Steinmayr, Andreas; Trebesch, Christoph (18 September 2013). "The Effect of Labor Migration on the Diffusion of Democracy: Evidence from a Former Soviet Republic". SSRN 2327441. ^ Pfutze, Tobias (1 June 2014). "Clientelism Versus Social Learning: The Electoral Effects of International Migration". International Studies Quarterly. 58 (2): 295–307. doi:10.1111/isqu.12072. ISSN 1468-2478. ^ Beine, Michel; Sekkat, Khalid (19 June 2013). "Skilled migration and the transfer of institutional norms". IZA Journal of Migration. 2 (1): 1–19. doi:10.1186/2193-9039-2-9. ISSN 2193-9039. ^ "Europe's Migration Crisis". Council on Foreign Relations. Retrieved 25 January 2017. ^ "Migratory and Refugee Movements in and from the Horn of Africa" (PDF). Retrieved 25 January 2017. ^ "Foundations of a Humane Asylum and Migration Policy of the EU" (PDF). Retrieved 25 January 2017. ^ "Preventing illegal migration flows". www.consilium.europa.eu. Retrieved 26 January 2017. ^ "Why eastern Europe's resistance to refugee quotas is not 'selfish'". The Guardian. 16 September 2015. Retrieved 29 January 2017. ^ Valentino, Nicholas A.; Soroka, Stuart N.; Iyengar, Shanto; Aalberg, Toril; Duch, Raymond; Fraile, Marta; Hahn, Kyu S.; Hansen, Kasper M.; Harell, Allison (2017). "Economic and Cultural Drivers of Immigrant Support Worldwide" (PDF). British Journal of Political Science: 1–2. doi:10.1017/S000712341700031X. ISSN 0007-1234. Archived from the original (PDF) on 11 June 2018. We conducted a series of survey experiments,fielded in nearly identical ways across eleven countries on four continents: Australia, Canada, Denmark, France, Japan, Korea, Norway, Spain, Switzerland, United Kingdom and the United States. Evidence from several of these individual country studies has presented elsewhere. ^ Moriconi, Simone; Peri, Giovanni; Turati, Riccardo (2018). "Skill of the Immigrants and Vote of the Natives: Immigration and Nationalism in European Elections 2007-2016". doi:10.3386/w25077. In this paper we document the impact of immigration at the regional level on Europeans’ political preferences as expressed by voting behavior in parliamentary or presidential elections between 2007 and 2016. ^ a b c d "Understanding Attitudes to Immigration: The Migration and Minority Module of the first European Social Survey". ^ Braakmann, Nils, Muhammad Waqas, and John Wildman. "Are immigrants in favour of immigration? Evidence from England and Wales." The BE Journal of Economic Analysis & Policy 17, no. 1 (2017). ^ a b Hainmueller, Jens; Hopkins, Daniel J. (12 May 2014). "Public Attitudes Toward Immigration". Annual Review of Political Science. 17: 225–249. doi:10.1146/annurev-polisci-102512-194818. ^ "Subscribe to read". www.ft.com. Retrieved 13 May 2017. ^ Rustenbach, Elisa (1 January 2010). "Sources of Negative Attitudes toward Immigrants in Europe: A Multi-Level Analysis". The International Migration Review. 44 (1): 53–77. doi:10.1111/j.1747-7379.2009.00798.x. JSTOR 20681745. ^ a b c d'Hombres, Beatrice; Nunziata, Luca (2016). "Wish You Were Here? Quasi-Experimental Evidence on the Effect of Education on Self-Reported Attitude toward Immigrants". European Economic Review. 90: 201. doi:10.1016/j.euroecorev.2016.02.007. ^ Malhotra, Neil; Margalit, Yotam; Mo, Cecilia Hyunjung (1 April 2013). "Economic Explanations for Opposition to Immigration: Distinguishing between Prevalence and Conditional Impact". American Journal of Political Science. 57 (2): 391–410. doi:10.1111/ajps.12012. ISSN 1540-5907. ^ a b Hainmueller, Jens; Hiscox, Michael J. (1 April 2007). "Educated Preferences: Explaining Attitudes Toward Immigration in Europe". International Organization. 61 (2): 399–442. doi:10.1017/S0020818307070142. ISSN 1531-5088. ^ Cavaille, Charlotte; Marshall, John (2018). "Education and Anti-Immigration Attitudes: Evidence from Compulsory Schooling Reforms across Western Europe". American Political Science Review: 1–10. doi:10.1017/S0003055418000588. ISSN 0003-0554. ^ Facchini, Giovanni; Margalit, Yotam; Nakata, Hiroyuki (27 December 2016). "Countering Public Opposition to Immigration: The Impact of Information Campaigns". SSRN 2889666. ^ Facchini, Giovanni; Margalit, Yotam; Nakata, Hiroyuki (9 January 2017). "Countering public opposition to immigration with information campaigns". VoxEU.org. Retrieved 13 May 2017. ^ Janus, Alexander (25 October 2010). "The Influence of Social Desirability Pressures on Expressed Immigration Attitudes". Social Science Quarterly. 91 (4): 928–946. doi:10.1111/j.1540-6237.2010.00742.x. ^ An, Brian P. "The role of social desirability bias and racial/ethnic composition on the relation between education and attitude toward immigration restrictionism." The Social Science Journal 52, no. 4 (2015): 459-467. ^ Halla, Martin; Wagner, Alexander; Zweimüller, Josef (29 November 2015). "Immigration and far-right voting: New evidence". VoxEU.org. Retrieved 13 May 2017. ^ "Donald Trump's supporters are LESS likely to be affected by trade and immigration, not more". Vox. 12 August 2016. Retrieved 13 May 2017. ^ a b Piekut, Aneta; Valentine, Gill (1 June 2016). "Perceived Diversity and Acceptance of Minority Ethnic Groups in Two Urban Contexts". European Sociological Review. 32 (3): 339–354. doi:10.1093/esr/jcw011. ISSN 0266-7215. ^ Kaufmann, Eric (2017). "Levels or changes? : Ethnic context, immigration and the UK Independence party vote". Electoral Studies. 48: 57. doi:10.1016/j.electstud.2017.05.002. ^ Harmon, Nikolaj A. (2018-09-11). "Immigration, Ethnic Diversity, and Political Outcomes: Evidence from Denmark". The Scandinavian Journal of Economics. doi:10.1111/sjoe.12239. ISSN 0347-0520. ^ Xefteris, Dimitrios; Matakos, Konstantinos; Marbach, Moritz; Dinas, Elias; Hangartner, Dominik (2018). "Does Exposure to the Refugee Crisis Make Natives More Hostile?". American Political Science Review: 1–14. doi:10.1017/S0003055418000813. ISSN 1537-5943. ^ Fielding, David (1 January 2015). "Traditions of Tolerance: The Long-Run Persistence of Regional Variation in Attitudes towards English Immigrants". British Journal of Political Science. 48: 1–22. doi:10.1017/S0007123415000575. ISSN 0007-1234. ^ a b Simonovits, Gábor; Kézdi, Gábor; Kardos, Péter (2017). "Seeing the World Through the Other's Eye: An Online Intervention Reducing Ethnic Prejudice". American Political Science Review. 112: 1–8. doi:10.1017/S0003055417000478. ISSN 0003-0554. ^ Lazarev, Egor; Sharma, Kunaal (April 2017). "Brother or Burden: An Experiment on Reducing Prejudice Toward Syrian Refugees in Turkey*". Political Science Research and Methods. 5 (2): 201–219. doi:10.1017/psrm.2015.57. ISSN 2049-8470. ^ Creighton, Mathew J., and Amaney Jamal. "Does Islam play a role in anti-immigrant sentiment? An experimental approach." Social science research 53 (2015): 89-103. ^ Helbling, Marc, and Richard Traunmüller. "What is Islamophobia? Disentangling Citizens’ Feelings Toward Ethnicity, Religion and Religiosity Using a Survey Experiment." British Journal of Political Science (2018): 1-18. ^ Aarøe, Lene; Petersen, Michael Bang; Arceneaux, Kevin (1 May 2017). "The Behavioral Immune System Shapes Political Intuitions: Why and How Individual Differences in Disgust Sensitivity Underlie Opposition to Immigration". American Political Science Review. 111 (2): 277–294. doi:10.1017/S0003055416000770. ISSN 0003-0554. ^ Smith, Jason Matthew (1 November 2010). "Does Crime Pay? Issue Ownership, Political Opportunity, and the Populist Right in Western Europe". Comparative Political Studies. 43 (11): 1471–1498. doi:10.1177/0010414010372593. ISSN 0010-4140. ^ Dinas, Elias; van Spanje, Joost (1 December 2011). "Crime Story: The role of crime and immigration in the anti-immigration vote". Electoral Studies. 30 (4): 658–671. doi:10.1016/j.electstud.2011.06.010. ^ Burscher, Bjorn; van Spanje, Joost; de Vreese, Claes H. (1 June 2015). "Owning the issues of crime and immigration: The relation between immigration and crime news and anti-immigrant voting in 11 countries". Electoral Studies. 38: 59–69. doi:10.1016/j.electstud.2015.03.001. ^ Rydgren, Jens (1 October 2008). "Immigration sceptics, xenophobes or racists? Radical right-wing voting in six West European countries". European Journal of Political Research. 47 (6): 737–765. doi:10.1111/j.1475-6765.2008.00784.x. ISSN 1475-6765. ^ Mayda, Anna Maria (1 August 2006). "Who Is Against Immigration? A Cross-Country Investigation of Individual Attitudes toward Immigrants". Review of Economics and Statistics. 88 (3): 510–530. doi:10.1162/rest.88.3.510. ISSN 0034-6535. ^ a b Gould, Eric D.; Klor, Esteban F. (1 July 2015). "The Long-run Effect of 9/11: Terrorism, Backlash, and the Assimilation of Muslim Immigrants in the West". The Economic Journal. 126 (597): n/a–n/a. doi:10.1111/ecoj.12219. ISSN 1468-0297. ^ Schüller, Simone (2016). "The Effects of 9/11 on Attitudes toward Immigration and the Moderating Role of Education". Kyklos. 69 (4): 604–632. doi:10.1111/kykl.12122. ^ Avdan, Nazli (1 December 2014). "Do asylum recognition rates in Europe respond to transnational terrorism? The migration-security nexus revisited". European Union Politics. 15 (4): 445–471. doi:10.1177/1465116514534908. ISSN 1465-1165. ^ a b c d Connor, Phillip; Krogstad, Jens Manuel. "Many worldwide oppose more migration – both into and out of their countries". Pew Research Center. Retrieved 2019-01-24. ^ Jensen, Richard (Spring 2009). "Comparative nativism: the United States, Canada and Australia, 1880s–1910s". Canadian Issues. Association for Canadian Studies: 45–55. ^ "Fact Sheet – Abolition of the 'White Australia' Policy". Australian Immigration. Commonwealth of Australia, National Communications Branch, Department of Immigration and Citizenship. Retrieved 27 March 2013. ^ a b "ISSUES OF THE ELECTIONS". The Age. Victoria, Australia. 6 October 1925. p. 11. Retrieved 9 December 2016 – via National Library of Australia. ^ Goot, Murray (November 2005). "Pauline Hanson's One Nation: extreme right, centre party or extreme left?". Labour History. Australian Society for the Study of Labour History (ASSLH). 89 (89): 101–119. doi:10.2307/27516078. JSTOR 27516078. ^ Ben-Moshe, Danny (July 2001). "One Nation and the Australian far right". Patterns of Prejudice. Taylor and Francis. 35 (3): 24–40. doi:10.1080/003132201128811205. ^ Scalmer, Sean (June 2001). "From contestation to autonomy: the staging and framing of anti-Hanson contention". Australian Journal of Politics and History. Wiley. 47 (2): 209–224. doi:10.1111/1467-8497.00228. ^ "What Do Europeans Think About Muslim Immigration?". Chatham House. Retrieved 2018-09-28. ^ "YouGov | Eurotrack: UK, Denmark, Finland and Norway not pulling their weight on migrants". YouGov: What the world thinks. Retrieved 2018-09-28. ^ Bar-On, Tamir (2013), "Neither right, nor left? ", in Bar-On, Tamir, Rethinking the French new right alternatives to modernity, Abingdon, Oxon: Routledge, pp. 39–41, ISBN 9781135966263. Preview. ^ Marozzi, Marco (2015). "Construction, robustness assessment and application of an index of perceived level of socio-economic threat from immigrants: a study of 47 European countries and regions". Social Indicators Research. Springer. 128: 1–25. doi:10.1007/s11205-015-1037-z. ^ Fetzer, Joel S. (2000). Public attitudes toward immigration in the United States, France, and Germany. Cambridge New York: Cambridge University Press. ISBN 9780521786799. ^ Mayer, Nonna; Perrineau, Pascal (July 1992). "Why do they vote for Le Pen?". European Journal of Political Research. Wiley. 22 (1): 123–141. doi:10.1111/j.1475-6765.1992.tb00308.x. ^ Pagnoncelli, Nando (2019-11-01). "Le colpe dell'emergenza migranti? Il 60% punta il dito contro l'Europa". Corriere della Sera (in Italian). Retrieved 2019-01-12. ^ Staff writer (23 June 2004). "Immigration time-bomb". Expatica. Bram Lebo. Archived from the original on 28 May 2006. Retrieved 11 August 2010. ^ Ray Hall; Paul White (2005). Europe's Population. Routledge. p. 136. ISBN 9781135369484. ^ TT. "Svenskar vill ha inhägnat boende | SvD". SvD.se (in Swedish). Archived from the original on 22 March 2016. Retrieved 2018-07-14. ^ Staff writer (23 April 2010). "BNP call for end to immigration from Muslim nations". BBC News. BBC. ^ a b Wilkinson, Michael (5 May 2015). "Immigration policies: General Election 2015 and how each party will tackle it". The Daily Telegraph. Telegraph Media Group. ^ "Triumph for 'Brexiteer' Nigel Farage, British scourge of the EU". ^ Kerry Garcia, Kate Fellows-Tully (22 March 2017). "Five costly immigration changes in April 2017". Personnel Today. Retrieved 19 May 2017. ^ The Immigration Skills Charge Regulations 2017, legislation.gov.uk. ^ a b c "Israel to Deport 40,000 Illegal Immigrants". www.israeltoday.co.il. Retrieved 2019-01-12. ^ "GOP senator says Israel border fence cut illegal immigration". @politifact. Retrieved 2019-01-12. ^ Novais, Andréa (30 November 2012). "Xenophobia in Brazil". The Brazil Business. Retrieved 2 November 2018. ^ a b Tsavkko Garcia, Raphael (16 Aug 2017). "Is Brazil no longer safe for refugees and immigrants?". Al Jazeera. Retrieved 2 November 2018. ^ Doce Villamar, Inacio (19 August 2018). "Tense calm on Brazil-Venezuelan border after anti-immigrant riot". Reuters. Retrieved 2 November 2018. ^ Gonzalez, Elizabeth (October 18, 2018). "Brazil Election: Where Jair Bolsonaro and Fernando Haddad Stand on Foreign Policy". Retrieved 2 November 2018. ^ a b c d e f González, Daniel. "Migración e identidad cultural en Costa Rica (1840-1940)". Revista de Ciencia Sociales UCR. Retrieved 12 October 2017. ^ a b c Acuña, Guillermo (2005). "La migración en Costa Rica" (PDF). Ministerio de Salud. Retrieved 12 October 2017. ^ Arias, L (November 23, 2016). "Costa Rican legislator praises Trump's tactics as he eyes new presidential bid". The Tico Times. Retrieved 12 October 2017. ^ a b Dobles, Ignacio; Vargas, Gabriela; Amadro, Krissia; Arroyo, Massiel (2013). "La inmigración y el Poder Legislativo en Costa Rica". Retrieved 12 October 2017. ^ Chinchilla, Aaron (25 July 2018). "Restauración Nacional exige al Gobierno reforzar controles migratorios en Peñas Blancas". El Periódico. ^ Pérez, Karla (January 2018). "Fabricio Alvarado: Hay que implementar una política migratoria fuerte". El Mundo. ^ Redaccion (26 August 2018). "Costa Rica marcha contra la xenofobia hacia los migrantes de Nicaragua que llegan al país huyendo de la crisis". BBC Mundo. Retrieved 2 November 2018. ^ Roman, Jose Antonio (24 August 2005). "Detienen en seis meses a 120 mil indocumentados de Centroamérica". La Journada. Desarrollo de Medios, S.A. de C.V. (DEMOS). Archived from the original on 24 October 2011. ^ "TV en vivo por internet y capítulos en línea". tvazteca.com. October 2004. Retrieved 14 September 2014. ^ Slagle, John W. (28 January 2006). 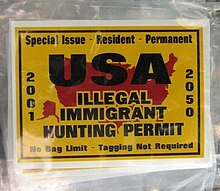 "Illegal alien amnesty, guest workers, international law and politics". American Chronicle. Ultio. Archived from the original on 7 October 2007. ^ Marisa Abrajano; Zoltan L. Hajnal (2015). White Backlash: Immigration, Race, and American Politics. Princeton University Press. pp. 31–35. ISBN 9781400866489. ^ a b Higham, John (1963). Strangers in the land: patterns of American nativism, 1860–1925. New York: Atheneum. OCLC 421752. ^ Ngai, Mae M. (Spring 2003). "The strange career of the illegal alien: immigration restriction and deportation policy in the United States, 1921–1965". Law and History Review. Cambridge Journals. 21 (1): 69–107. doi:10.2307/3595069. JSTOR 3595069. ^ Camarota, Steven A. (October 2000). "New INS Report". cis.org. Center for Immigration Studies. Retrieved 14 September 2014. See also: INS (September 2000). Statistical yearbook of the Immigration and Naturalization Service, 2000 (PDF). Washington, D.C.: Immigration and Naturalization Service, U.S. Department of Justice. OCLC 780095878. M-367. ^ Peters, Jeremy W. (25 November 2014). "Obama's Immigration Action Reinvigorates Tea Party". The New York Times. The New York Times Company. Retrieved 29 January 2015. ^ Zong, Jie; Batalova, Jeanne. "Frequently Requested Statistics on Immigrants and Immigration in the United States". Migration Policy Institute. Retrieved 30 January 2017. ^ Collomp, Catherine (October 1988). "Unions, civics, and National identity: organized Labor's reaction to immigration, 1881–1897". Labor History. Taylor and Francis. 29 (4): 450–474. doi:10.1080/00236568800890311. ^ Lane, A.T. (January 1984). "American trade unions, mass immigration and the literacy test: 1900–1917". Labor History. Taylor and Francis. 25 (1): 5–25. doi:10.1080/00236568408584739. ^ Mink, Gwendolyn (1986). Old labor and new immigrants in American political development: union, party, and state, 1875–1920. Ithaca: Cornell University Press. ISBN 9780801418631. ^ Baird, Peter; McCaughan, Ed (1979). Beyond the Border: Mexico & the U.S. Today. North American Congress on Latin America. p. 169. ISBN 9780916024376. ^ Arellano, Gustavo. "The year in Mexican-bashing". OC Weekly. Archived from the original on 9 June 2014. Retrieved 18 June 2014. ^ Navarrette Jr., Ruben (30 March 2005). "The Arizona Minutemen and César Chávez". San Diego Union Tribune. Archived from the original on 5 August 2009. ^ Jamieson, Dave (19 June 2013). "Senator Sounds Alarm On Teen Unemployment". The Huffington Post. Retrieved 15 June 2015. ^ Thibodeau, Patrick (1 May 2015). "Meet Bernie Sanders, H-1B skeptic". Computerworld. Retrieved 15 June 2015. ^ Bier, Daniel. "Bernie Sanders on Immigrants: Silly, Tribal and Economically Illiterate". Newsweek.com. Retrieved 27 July 2016. ^ Massimino, Cory. "Bernie Sanders is wrong on open borders; they'd help boost the economy". the Guardian. ^ "South Africa anti-immigrant violence: Hundreds held". 19 April 2015. ^ "South Africa riots: Violence against immigrants spreads to Cape Town". 23 May 2008. ^ Karlsson,TT, Mia Holmberg. "Våld mot migranter skapar oro i Sydafrika". gp.se (in Swedish). Retrieved 2019-04-16. Alexseev, Mikhail A. (2006). Immigration phobia and the security dilemma: Russia, Europe, and the United States. Cambridge New York: Cambridge University Press. ISBN 9780521849883. Jensen, Richard (Spring 2009). "Comparative nativism: the United States, Canada and Australia, 1880s–1910s". Canadian Issues. Association for Canadian Studies: 45–55. Allerfeldt, Kristofer (2003). Race, radicalism, religion, and restriction immigration in the Pacific Northwest, 1890-1924. Westport, Connecticut: Praeger. ISBN 9780313093036. Anbinder, Tyler (2006), "Nativism and prejudice against immigrants", in Ueda, Reed, A companion to American immigration, Malden, Massachusetts Oxford: Blackwell Publishing, pp. 177–201, ISBN 9780631228431. Excerpt. Barkan, Elliott R. (Summer 2003). "Return of the nativists? California public opinion and immigration in the 1980s and 1990s". Social Science History. Cambridge Journals. 27 (2): 229–283. doi:10.1017/S0145553200012530. JSTOR 40267808. Higham, John (1963). Strangers in the land: patterns of American nativism, 1860–1925. New York: Atheneum. OCLC 421752. Hueston, Robert F. (1976). The Catholic press and nativism, 1840–1860. New York: Arno Press. ISBN 9780405093425. Schrag, Peter (2010). Not fit for our society nativism and immigration. Berkeley: University of California Press. ISBN 9780520259782. Palmer, Howard (1982). Patterns of prejudice: a history of nativism in Alberta. Toronto, Ontario: McClelland and Stewart. ISBN 9780771069475. Robin, Martin (1992). Shades of right: nativist and fascist politics in Canada, 1920–1940. Toronto Buffalo: University of Toronto Press. ISBN 9780802068927. Ward, W. Peter (2002) . White Canada forever popular attitudes and public policy toward orientals in British Columbia (3rd ed.). Montreal, Quebec: McGill-Queen's University Press. ISBN 9780773569935. Betz, Hans-Georg (2007), "Against the 'Green Totalitarianism': Anti-Islamic nativism in contemporary radical right-wing populism in Western Europe", in Schori Liang, Christina, Europe for the Europeans the foreign and security policy of the populist radical right, Aldershot, England Burlington, Vermont: Ashgate, pp. 33–54, ISBN 9780754686255. Finzsch, Norbert; Schirmer, Dietmar, eds. (1998). Identity and intolerance : nationalism, racism, and xenophobia in Germany and the United States. Washington, D.C. Cambridge: German Historical Institute Cambridge University Press. ISBN 9780521591584. Lucassen, Leo (2005). The immigrant threat: the integration of old and new migrants in western Europe since 1850. Urbana, Illinois: University of Illinois Press. ISBN 9780252072949. Examines Irish immigrants in Britain, Polish immigrants in Germany, Italian immigrants in France (before 1940), and (since 1950), Caribbeans in Britain, Turks in Germany, and Algerians in France. Schori Liang, Christina, ed. (2007). Europe for the Europeans the foreign and security policy of the populist radical right. Aldershot, England Burlington, Vermont: Ashgate. ISBN 9780754686255.